Allergy Advice: Contains Wheat, Soy, Celery, Sesame. Store away from high heat for best quality and consistency. After opening, refrigerate unused sauce mix in a sealed container. Ingredients: Vegetable Oil (Palm Oil, Rapeseed Oil), Wheat Flour, Salt, Corn Flour, Curry Powder (Spice, Coriander Seed, Mandarin Orange Peel) (5%), Flavour Enhancer (E621), Colour (E150a), Spice (Celery), Sauteed Curry Paste (2%), Garlic Powder (Defatted Soybean), Sauteed Onion Paste (Defatted Soybean), Yeast Extract, Defatted Soybean, Sauteed Onion Paste (Defatted Soybean), Yeast Extract, Defatted Soybean, Emulsifier (Soy Lecithin), Roasted Onion Powder, Sesame Paste, Emulsifiers (E473, E471), Acid (E330), Onion Powder (Soybean Powder), Sugar, Acid (E296), Roasted Garlic Powder, Onion Seasoning (Soy Sauce (Soybean, Wheat)), Fermented Wheat Seasoning (Wheat, Yeast), Garlic Extract, Flavour Enhancers (E631, E627), Glucose, Acid (E270), Natural And Artificial Flavouring, Sweetener (E955). 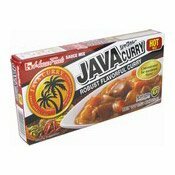 Simply enter your details below and we will send you an e-mail when “Java Curry Sauce Mix (Hot) (日本式中辣咖哩醬)” is back in stock!